Fundamentals of Transfer Pricing aims to capture the concepts and fundamental principles of transfer pricing by providing theoretical and practical knowledge on transfer pricing topics. Transfer pricing continues to be one of the most significant areas of heightened controversy in international taxation for multinational enterprises and tax administrations. Due to its far-reaching consequences, tax professionals and individual tax jurisdictions are required to understand the fundamentals of the topic, which is often caught in a maze of literature. Emerging from the joint research conducted by the WU Transfer Pricing Center at the Institute for Austrian and International Tax Law at WU, Vienna University of Economics and Business, the international tax law firm L&P – Ludovici Piccone & Partners and the experiences from the annual advanced transfer pricing courses and conferences, this book acts as a manual for understanding transfer pricing principles and their practical application. It provides a balanced approach by detailing the basics of transfer pricing and then proceeding to specific topics that are highly relevant in today’s tax environment. In analysing the above topics, the work undertaken by the OECD, UN, EU, World Customs Organization, World Bank, International Monetary Fund and other international organizations is considered. Moreover, the book contains several practical examples, judicial precedents and illustrative explanations to complement the understanding. Considering the evolving nature of transfer pricing in the specific topics mentioned above, this book will be periodically updated in order to provide up-to-date guidance to its first publication. 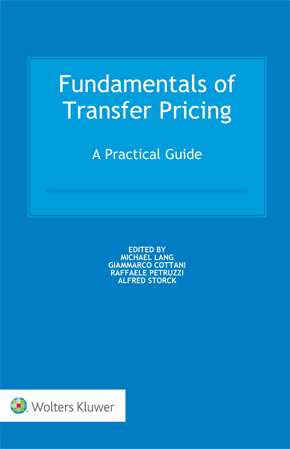 This book is also used as a reference tool in the Advanced Transfer Pricing Courses organized by the WU Transfer Pricing Center. The book will be a catalyst for immense learning of students and young professionals who are at the introductory stage of understanding the nuances of transfer pricing. Further, the book also caters to tax lawyers, in-house tax counsels and academics working in international organizations, the business community and advisory firms as well as government officials interested in understanding transfer pricing. Petruzzi, R., Cottani, G., Sollund, S. & Prasanna, S.
Prasanna, S. & Petruzzi, R.
Brown, M. & Orlandi, M.
Gonnet, S. & Madelpuech, G.
Buriak, S. & Striato, M.
Piccone, P.F., Burkadze, E. & Peng, C.
Peng, C. & Petruzzi, R.
Cottani, G. & Ludovici, P.
Prasanna, S. & Quattrocchi, Z.
Cremer, I. & Lim, B.
Miladinovic, A. & Szudoczky, R.